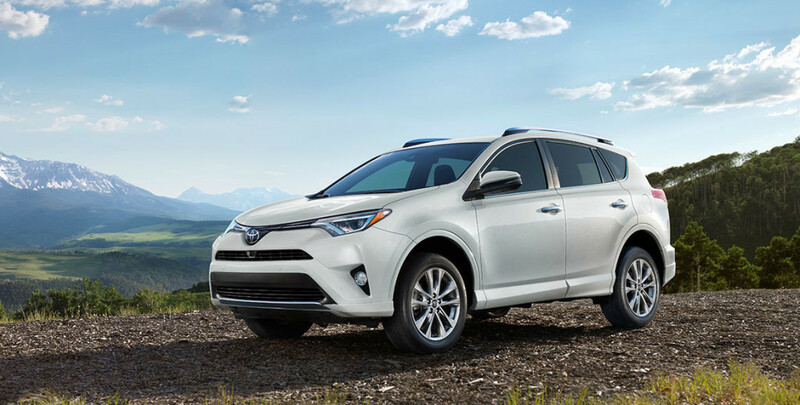 The 2017 RAV4 is a Compact Crossover SUV that handles any demanding lifestyle with its sporty, spirited performance, impressive cargo capacity, and lengthy list of innovative technologies and safety features. It now features a refreshed exterior with premium soft-touch materials and exciting new technology that provides a fun, energetic drive. 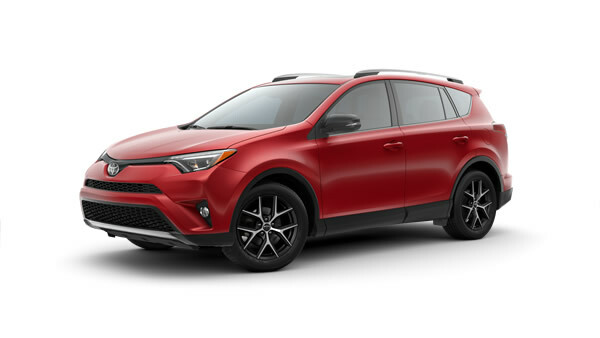 The RAV4 is available in six uniquely equipped models that include front or all-wheel drive, a Sports model and also a Hybrid for an increased performance in fuel efficiency. The new 2017 RAV4 also comes in a new colour, Galactic Aqua Mica which is available on XLE, SE, and Limited models. The 2017 Toyota RAV4 is a 5-door Compact Crossover SUV with a starting price of $27,395. The standard engine is a 2.5-litre, Dual VVT-i Engine, DOHC four-cylinder block paired up to a shiftable six-speed automatic transmission capable of easily producing 176 horsepower. The Hybrid model as an output increased to 194 horsepower, with the addition of two electric motors and a CVT automatic transmission. The interior is designed with plenty of space in mind to keep the driver and all passengers comfortable with plenty of space left over for cargo. City/highway fuel economy for the RAV4 ranges from 10.0/7.8 L/100 km to 6.9/7.8 L/100 km for the standard engine and the Hybrid model respectively. 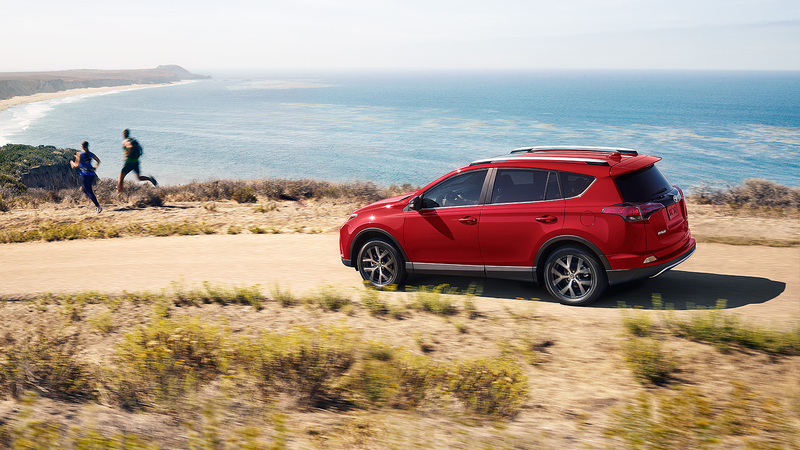 The RAV4 comes decked out from head to foot with safety and design features created so that you and your passengers can be at ease when commuting. A network of eight air bags surround the driver’s and passengers’ seats ready to inflate in case of a direct collision. Larger brakes give the RAV4 unprecedented stopping power even in unfavorable conditions. Of course, the RAV4 is loaded up with Toyota’s world-renown Toyota Safety Sense TM system, which is an integration of active safety features that helps prevents accidents from occurring. It comes standard across all 2017 models and it includes Pre-Collision System with Pedestrian Detection, Lane Departure Alert with Steering Assist, Dynamic Radar Cruise Control, and Automatic High Beams. Make an impression coming and going. RAV4 SE wears its energetic spirit on its sleeve, with a distinctly aggressive grille and front bumper combination, boldly sculpted LED headlamps, tail lamps, and daytime running lights, and SE-specific 18” alloy wheels. A quiet interior starts with the exterior. Extensive use of high tensile steel gives RAV4 a body structure that’s both strong and light. Additional sound-deadening materials and an acoustic windshield dramatically reduce the transmission of road and wind noise into the passenger cabin. Balance was a key theme in every aspect of the RAV4’s design, providing a seemless combination of aggressive performance and looks with an air of elegance and overall smooth ride. The styling is newly updated, including a well-organized technology user interface, a sleeker front fascia, and a new SE model that offers LED headlights and additional sporty styling elements inside and out in addition to sharper handling. An easy loading rear liftgate provides easy aspect to its generous cargo space, and available to the XLE, SE and Limited trims are programmable height settings that the RAV4 will recall and lift up to all on its own with the touch of a button. The tech-savvy are sure to be happy with the RAV4’s available advanced 6.1”-7” touchscreen audio system hooked up to premium 11-speaker JBL audio system designed to deliver a true audiophile experience. Also available is Toyota’s latest Navigation System with advanced voice recognition and text-to- speech capabilities. 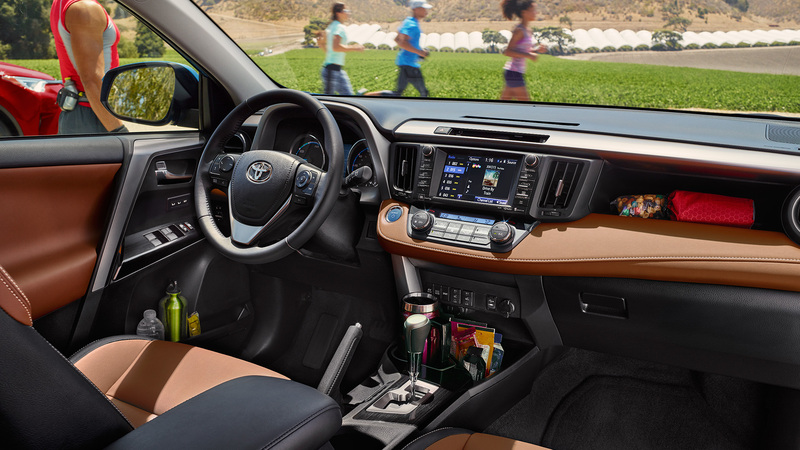 There’s no better way to experience the RAV4 than by getting inside one and seeing it all for yourself. When you are ready, we’ll be right here to help. Visit Sherwood Park Toyota today at 31 Automall Rd, Sherwood Park, Alberta.